North ecological new district is made up of Liuzhou municipal party committee, municipal government directly under the jurisdiction of the new urban district urbanization construction demonstration district and wisdom, planning area of about 680 square kilometers, the development of intelligent manufacturing, smart grid, a new generation of information and communication of new energy, new materials, aerospace, biomedical, modern agriculture, finance and other industries. According to the strategic arrangement of the Guangxi Province and China Southern Power Grid co., ltd. on jointly building Liuzhou smart grid industrial park, in order to promote the development and construction of industrial park, improve the smart grid industrial chain, create a new model of government-enterprise cooperation, share opportunities, common development and joint promotion, March 20, 2019, Liuzhou northern ecological new district management committee, deputy director Shen Jiangtong, Liuzhou ecological new city investment promotion bureau deputy director Lin lei, Liuzhou northern ecological new district economic development council, deputy director of Xiong Guijun, Liuzhou industrial park in south power network operation Co.,ltd., chairman Zhou Yuanfei, directors and senior leaders of the southern power grid future development planning of Liuzhou ecological new city in northern perfect industry chain construction and cooperation, came to Shenzhen LaunchDigital Technology Co., ltd., has carried on the visits and exchanges. According to industry experts, thermal imagers which could detect any object that emits heat including the human body are ideal choice for autonomous vehicle system and excellent sensors for detecting pedestrians, animals, cars, tires and the environment we are facing with, besides heat detectors could improve the safety of autonomous vehicles significantly.It is certain that the automakers of thermal imagers will produce and sell autonomous vehicles in a large scale in the future, but they must answer a key question before purchasing by consumers: are they safe? In theory, the safety of autonomous vehicles could be guaranteed, because almost all the car crashes are caused by human error in America, the supporters of autonomous vehicles argue that self-driving technology could reduce the risk of injury or death in the traffic dramatically. As the automakers increase the intensity of R&D for autonomous vehicles, the suppliers are also developing systems vigorously to promote their safety. FLIR Systems (hereinafter referred to as FLIR) is a company that specializes in manufacturing thermal imagers. Chris Posch, FLIR’s director of automotive applications engineering demonstrated the working principle of thermal imagers for journalists who reported the North American International Auto Show (NAIAS) held from Jan 14th to 27th of 2019 in Detroit of America and he thought that thermal imagers were ideal choice for autonomous vehicle systems because they could detect any object that emits heat including the human body. ‘Thermal imagers are excellent sensors for detecting pedestrians, animals, cars, tires and the environment we are facing with’ Posch said, according to MEMS Consulting. 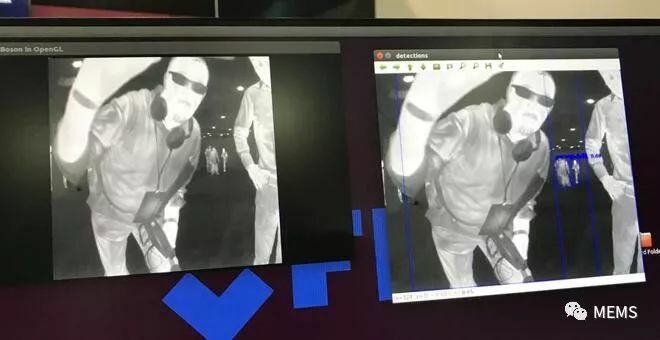 Thermal imagers form images through detecting heat and have great advantage of good working ability at night comparing with other sensors while it is impossible to see anyone at night with common cameras. Therefore, Posch mentioned the car crash of autonomous vehicles happened in Arizona USA in 2018: Late March 18th, 2018 in Tempe, a woman riding on a bike was killed when crossing the street by a self-driving car, which was a testing Volvo XC90 with special equipment belonging to Uber that provided car-sharing service. The autopilot system was operating normally when the accident happened according to a preliminary report from the National Transportation Safety Board（NTSB）.Uber’s system consists of such software and hardware as front and lateral cameras, navigation sensors, radar and Lidar together. The working principle of lidar is similar with radar but it emits pulses of infrared light and measures the time required after casting to a nearby object and back according to NTSB. The car’s radar and lidar detected Elaine Herzberg (the accidental woman) six seconds before the crash but the system didn’t classify the woman as a pedestrian immediately, claimed by investigators. At that time, although the Volvo car was under the computer control, the ‘backup’ driver should be able to intervene behind the wheel if something went wrong, while the autopilot system which didn’t warn the driver before the crash (without relative design) just determined that an emergency brake was needed to avoid knocking down Herzberg less than two seconds before the crash. The driver didn’t pay attention to the road according to Tempe police and Chris Posch explained that the thermal imager was very useful under such circumstance. ‘The thermal imagery technique could work under complete dark environment and it is the best sensor to detect human proximity when there’s an object appeared in the view field and nearing the car in the dark’ said Posch. How about the test range of thermal imagers? ‘The detection range mainly depends on the view field of lens with detecting distance of 200 meters away for narrower view field’ said Posch, besides the efficiency of thermal imagers also depend on the neural network speed of autonomous vehicles. The faster the neural network calculates, the faster the thermal imager is able to process what it ‘sees’ and react to prevent accidents. FLIR has noted 14000 thermal video images, provided freely to the public. The final report of NTSB on the cause of the car crash in Arizona hasn’t yet come out and the agency’s website was not updated due to a partial shutdown of the federal government. On October 13 - 16, 2016 Hong Kong Electronic Fair (Autumn Edition) & International Electronic Components and Production Technology Exhibition was grandly held at Hong Kong Convention and Exhibition Center. As a leading intelligent infrared solution provider in Mainland, Launch Digital appeared at this international electronics event with multiple products and modules. Among the numerous infrared products, the new product P1 infrared card machine was favored by the numerous buyers from all the places including America, Europe and Asia due to its characteristics of being small, light and convenient, simple operation and outstanding imaging effect, and they expressed their sales or agent intention one after another. P1 is a portable infrared thermal imager of high cost performance introduced by Launch Digital, and in the card mobile phone patter with the size of only 125 * 72mm (L * W) and the thickness of 16mm, it can be carried in the pocket. P1 has the complete temperature measurement functions, supports the central-point temperature measurement and automatically tracks the highest and lowest temperature points in the image; with the 3.5-inch big screen, it is easy to be operated, 50&deg; compared with the traditional gun-type thermal imager, it is easier to conduct observation with the field angle. As an entry-level portable infrared thermal imaging tool, P1 can be widely applied to the industries such as the electronics, building (such as floor heating and leak detection), mould processing, vehicle maintenance, food processing, the powder industry patrol inspection and rail traffic patrol inspection, which will bright the extreme operation convenient to the users. The UAV infrared thermal imager, the micro online infrared thermal imager, the micro infrared thermal imaging and double spectrum infrared thermal imaging modules were also exhibited at this exhibition at the same time, and Launch Digital took full advantage of this exhibition to exchange and negotiate with the domestic and foreign guests to further promote the visibility and influence of the enterprise brand; meanwhile, it also conducted further deepened discussions with industrial experts so as to better improve its own products, giving play to its own advantages. Shenzhen Launch Digital Technology Co., Ltd., founded in 2005 and with the registered capitals of RMB60.5 million, is the domestic leading intelligent service robot solution provider and innovative-type infrared thermal imaging technology promoter. It is a national new high-tech enterprise specializing in AI, electromechanical control, machine vision, deep learning and comprehensive application development of infrared temperature measurement technology.